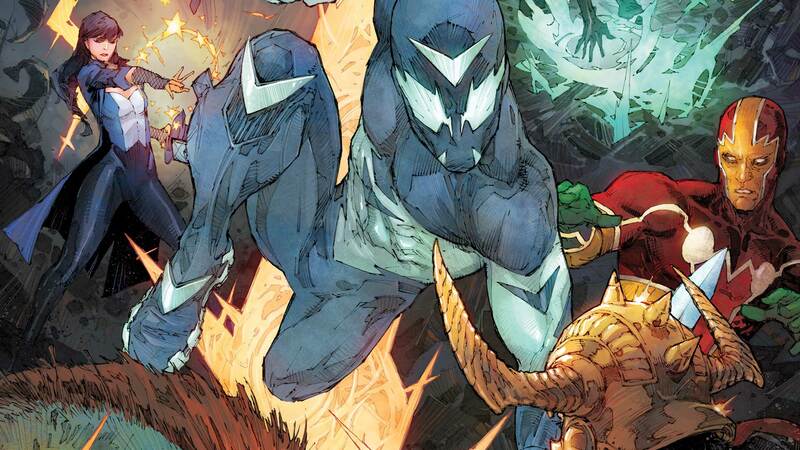 The Seven Soldiers of Victory make an (almost) complete return as they recruit Derek James for a dangerous mission in this sneak peek at SIDEWAYS #8. Okay, maybe Derek James’ high school experience is a little wilder than the rest of ours. But then again, we weren’t high school superheroes. The dimension-hopping Sideways has been having a hard enough time dealing with the recent death of his mother and sudden responsibility that’s been placed on him after learning he could open rifts between dimensions. But when six of the Seven Soldiers show up at his high school asking for his help taking down the Sheeda in the Dark Multiverse, well, even an angst-filled adolescent can’t say no to that. SIDEWAYS #8 by Max Raynor, Trevor Scott and Dan DiDio is in stores this Wednesday.